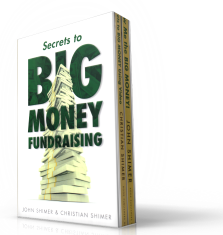 Successful fundraising starts with an awareness that money is needed to accomplish something that someone or some organization believes is important. Fair enough, right?! But then what? The world of volunteer giving is mysterious because it is so counter-culture and counter-intuitive. Imagine you are making your first visit to the county fair and you see this haunted-house ride that (if you decide to take it) straps you into what looks like an iron chariot to hell. The circus barker incites you with visions of the thrills and chills that await you inside the dark, cavernous, haunting doorway that your iron chariot will catapult you through if you only have the courage to get on board. Today’s special prize for anyone brave enough to take this ride is a free ice-cream cone. You really want that ice-cream cone. But do you want it badly enough to sign up for the ride? It’s your fear of the unknown that holds you back. And who could blame you? The need to raise money often appears to the uninitiated like an invitation to take that ride through the county fair’s haunted house. The promise of having ample money to carry out your higher-purpose goals is the ice-cream cone awaiting you at the end of the ride. But here’s the thing that should give you courage. When it’s done right, fundraising is all about doing the right thing, for the right reasons, with the right people, for the benefit of others. Yet, the fact that you haven’t done it before or maybe you’ve had some disappointing false starts in the past is why it’s all so frightening now. Popular culture teaches us to get money using more familiar paradigms. And humans always tend to embrace the familiar. Let’s look at three financial transaction paradigms that we know more about. The first is the paradigm of theft. This is probably the least embraced paradigm for getting money, but we all know about it. Any activity that is based on deceit, trickery, or force to cause money to change hands is theft. No matter your moral opinions about theft, it is a paradigm familiar to all of us. The second paradigm is the command-response paradigm of government bodies. By agreement, we give certain powers to governments to legislate and then to exact payments from us for the common good (taxes). When ordered to pay taxes, levies, penalties, or fees by governments, money quickly changes hands. Citizens are the responders; governments give the commands. It’s all so simple. The third paradigm is bartering. Bartering is an exchange of goods and services between willing participants, all believing their trade will leave them better off than they were before the exchange took place. When paper money is used to facilitate the barter, that doesn’t change the paradigm. If it is done right, both parties in the exchange still walk away believing they have something they really wanted. These first three paradigms are simple, straightforward, and well understood by almost everyone. Yes, in the real world, these three paradigms get jumbled up, and there are many themes and variations on them. Deviant behavior is everywhere in society, and deviants create paradigm complications all the time. Let’s acknowledge that right now. However, I’m assuming you are not a deviant. I’m assuming you are a completely normal human being who is drawn to the field of charitable gift fundraising because you have a higher-purpose value system and higher-purpose goals for your life. For those reasons, you need or desire a better understanding of a fourth financial transaction paradigm, the charitable-giving paradigm. I’ll try to provide that for you in these blogs. Initially, this entire topic of charitable giving may make little sense to you. When money changes hands in this paradigm, the giver receives what? At first glance, it would appear that the giver receives nothing, or at least no thing that in any way enhances his or her life. If this is an oversimplification, then let’s try to figure out what is really going on. After all, why would anyone give his or her money if the person receives nothing in return? What is the charitable giving transaction really based on, and why do so many people participate in this money-exchange paradigm? The first answer to this question is that charitable giving is about doing the right thing. Just saying this implies that the charitable giving paradigm has a moral connotation or a moral dimension. Could that be true? Talking about moral or even ethical behavior can get very sticky. Human beings have so many different ideas about right and wrong. Because I’m a Christian, my moral compass is attuned to the teachings of Jesus Christ. Long ago, however, I grasped that there are countless moral platforms that human beings build their life upon. And these different moral platforms are the basis for many (if not most) human conflicts. Even people who claim to build their lives on the same moral platform have gigantic differences of opinions. Sometimes those differences of opinions get people so agitated they are ready and willing to kill one another. As you read these blogs and learn the lessons in them, hold this observation of human behavior at the very forefront of your mind. Understanding and accepting the way humans differ about the ideas of right and wrong will keep you sane as you learn about how to build a charitable giving community.